In a document sent to the Prime Minister last week, which was reported by VnEpress.net, Deputy Minister Nguyen Van Cong evaluated that Damen’s purchase will be an opportunity to lure more investment capital and set the foundation for better cooperation between Damen and other SBIC companies in the future. “SBIC is making progress in market expansion, especially in the world market, to earn the trust of foreign investors,” Cong noted. Therefore, the ministry has asked the Prime Minister to allow the purchase, which will be held through direct negotiations between the two sides. A price will be set in line with regulations,” Cong remarked. Chairman of SBIC Nguyen Ngoc Su said the corporation has had several meetings with Damen’s representatives to discuss various ways to solve difficulties and strengthen the investment cooperation between the two groups. The SBIC has suggested Damen to first buy 49% of Song Cam shares. Later, when business conditions become more convenient and the Government approves, the SBIC will sell more Song Cam shares to increase Damen’s ownership to 70% as it desires. “However, Damen has no intension to purchase Song Cam shares in such a way. They expect the Government to allow it to buy 70% of shares in one go,” said Su. Su pointed out that Damen has been SBIC’s most important partner. 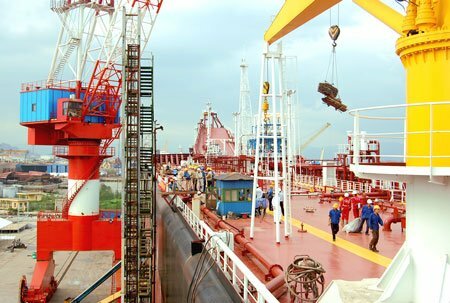 It has been supplying materials to Vietnamese shipbuilding companies. For example, all the orders of Song Cam-Ben Kien shipbuilding factory come from Damen. The firm has also supplied to Ha Long shipbuilding factory, ensuring jobs for workers until the end of 2016. It has plans to supply the orders of Pha Rung factory in the future. However, after failing to expand its investments in Vietnam, Damen has begun moving a number of orders to other countries.